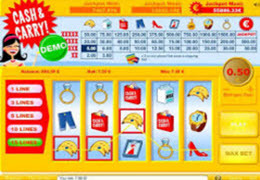 This month, a lucky online gambler was able to win £160,563 while playing the video slot “Cash & Carry” at Paf Casino. This fortunate win took place only minutes after it turned to January 11th, 2016. The winning player whom has already received their funds has opted out of revealing their personal information which caused for a delay in Paf Casino’s announcement of this jackpot win. This 5 reel, 15 payline video slot resembles a classic slot in its design. There is no true background to it, instead just symbols on the reels. Every icon showcased is an item you’d see at a mall such as a watch, ring, perfume, pants or shoes. This game offers three different progressive jackpots, one of these three progressives are triggered every two weeks. Most of the time the wins ranging around £61,000.